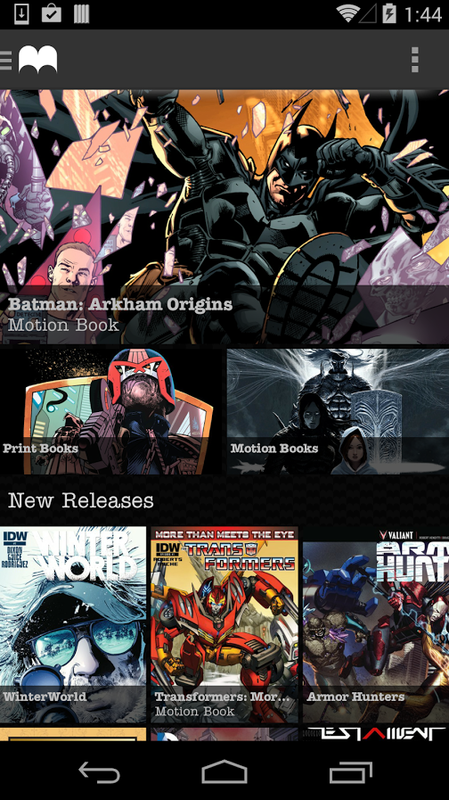 Madefire’s Motion Books, the digital comics publishing platform that combines images, sound and interactivity, has launched on Android and is now available on the Google Play Store. Titles are available via in-app purchase. In addition, Madefire has announced a new Print Books category designed to offer an authentic comics reading experience, featuring simple page view, pinch and zoom navigation for a large catalog of comics and graphic novels. A new interface for all storefronts promises to make it easier to navigate and discover books. Publishers such as IDW, Valiant, Oni Press, Top Cow, Liquid Comics, and others have signed on to the new Print Books category giving Madefire the rights to thousands of comics titles across a variety of screens and devices. This all comes on the heels of other recent developments for the company. Within the last two weeks, Madefire, in conjunction with the on-line artistic community DeviantArt, rolled out its Web-based Create Tool, letting individual artists and authors create new stories that can be published on the Web within minutes.